I’ll admit upfront that if it wasn’t Christmas time, I probably wouldn’t be writing about this song. That said, if it wasn’t Christmas time, I probably wouldn’t be writing about any Christmas songs, a category with which I’ve always had a fraught relationship. Happily, though, here we are, in the middle of Otis Redding, and it’s Christmas, so why the hell not? Recorded prior to his death — duh! — “Merry Christmas, Baby” was the b-side of the “White Christmas” single that Stax put out in late 1968; the first of the posthumous singles not to chart, which doesn’t really mean anything I guess. 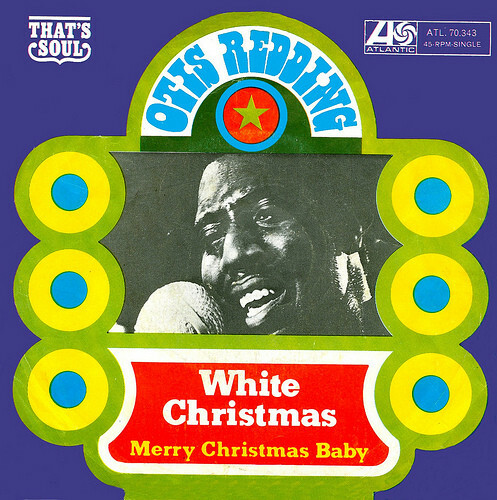 Like “White Christmas,” “Merry Christmas, Baby” was a cover, and in fact, Booker T & The MGs had previously done a bluesy, jazzy cover a couple of years previously. Which sounds nothing like the version they cooked up with Otis, of course. With Booker T. Jones playing a lead organ line that inverts the verses of “Jingle Bells” and Steve Cropper slinking around his guitar, “Merry Christmas, Baby” is a hoot and a holler, listening to the radio, checking out their presents and kissing under the mistletoe, all climaxing with a stop-time bridge. As always, Otis kills it during this part, especially on the “ha ha ha” which perfectly splits the difference between singing and laughing. After that, it’s a couple of modulations, as Otis continues to list all of the reasons he’s having a wonderful time. It’s a total mood shift from what you normally expect from Otis Redding: he’s actually singing about having fun in the middle of a healthy relationship. It’s a Christmas miracle for Mr. Pitiful!